Contrary to popular opinion, anarchy does not rule the roads in Italy. Except in Naples. (More about that, as we go along.) Elsewhere, however, there is a certain joie de vivre, a live-and-let-live attitude (to a point) about road-sharing, a sense of creativity, of endless possibilities for improvisation, an opportunity to think outside the box – in other words, a dystopian sort of order (even etiquette) to things. And being in sync with that order will make you right with the Italian universe of drivers, undetectable as tourist, and able to rent cars without signing up for the collision damage waiver. If your doors are locked, they can only steal your wheels. #2: Don’t pass on the right. Ever. Unless you are a) on a moped, b) committing a crime, or c) in Naples (in Naples, all may apply). #3: Never drive continuously in the left lane on the autostrada unless you are a) passing, b) in an Audi, or c) in … okay, no more Naples jokes. #5. Making a “pit stop” in Italy has nothing to do with a) stopping at a rest area, b) Formula 1, c) refueling. It has to do with taking a leak. And it is accepted practice. Everywhere. 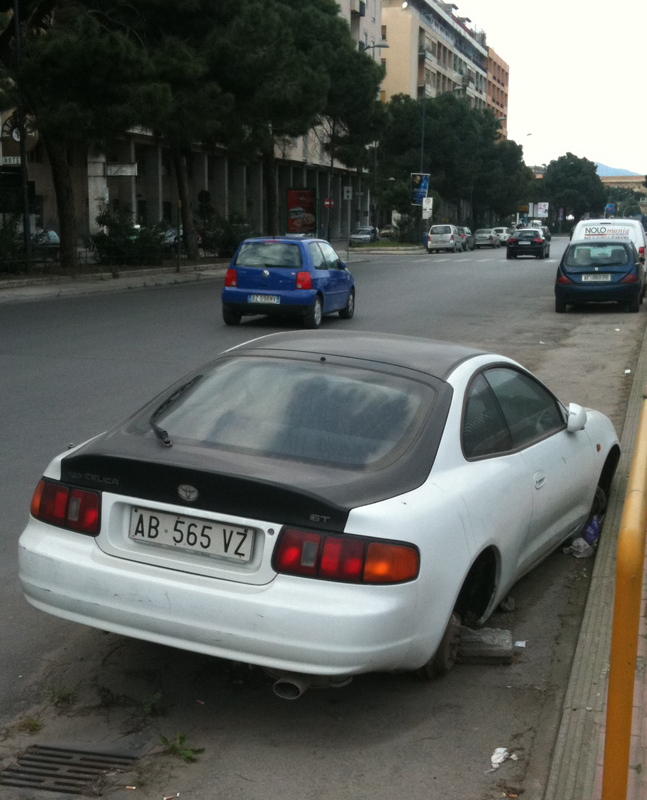 Even in neighborhoods, in autostrada medians and in cities. As long as you are a guy. Women? Suffer. 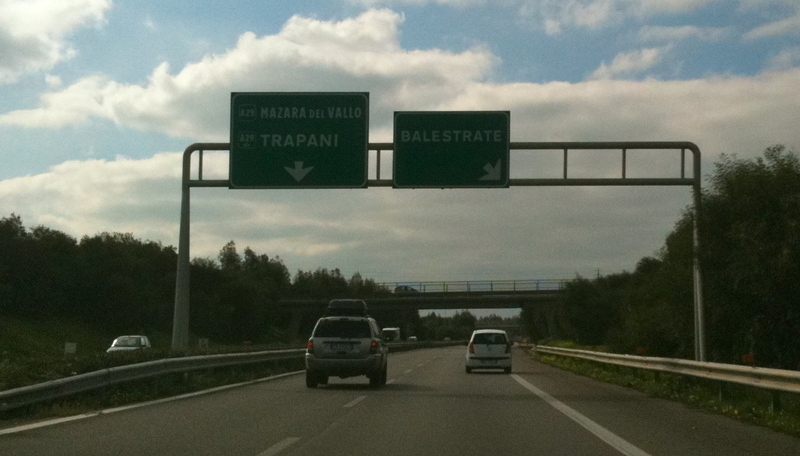 Meaningless photo taken on Italian autostrada. #6. Obey speed limits. To a degree. 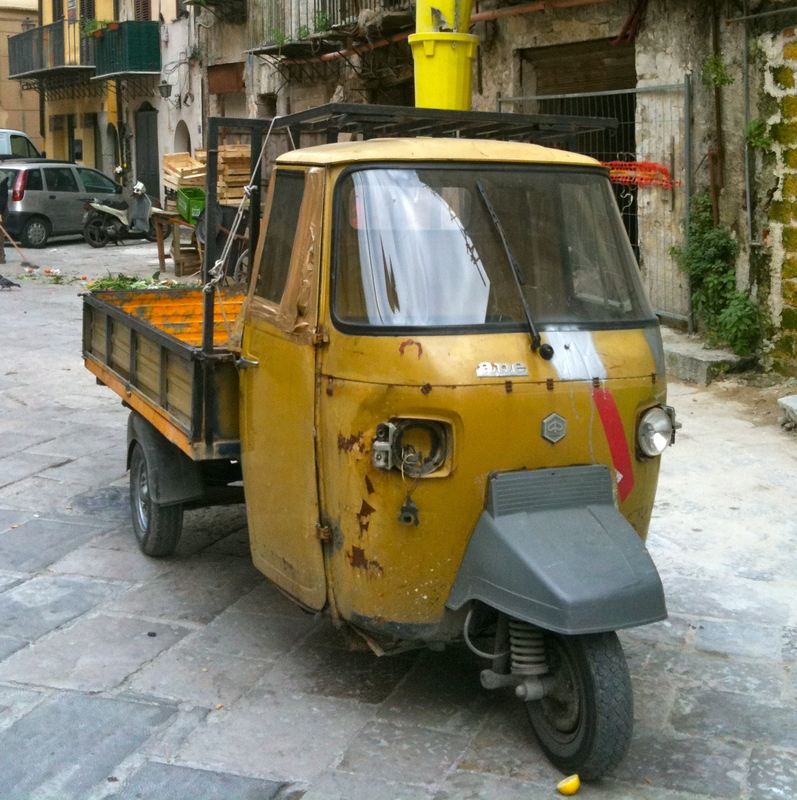 Nobody keeps it under 100/kmh except Fiat Seicento and Piaggio Ape 50 drivers. Speeders, police won’t stop you; they will just take your picture and mail a ticket to the registered owner of your car’s license plate. Renters: Leave the country quickly, if you think you’ve been cited. Report your credit cards stolen as soon as you get home, and get new numbers issued, before rental agencies can tack on the fines for the speeding ticket(s). 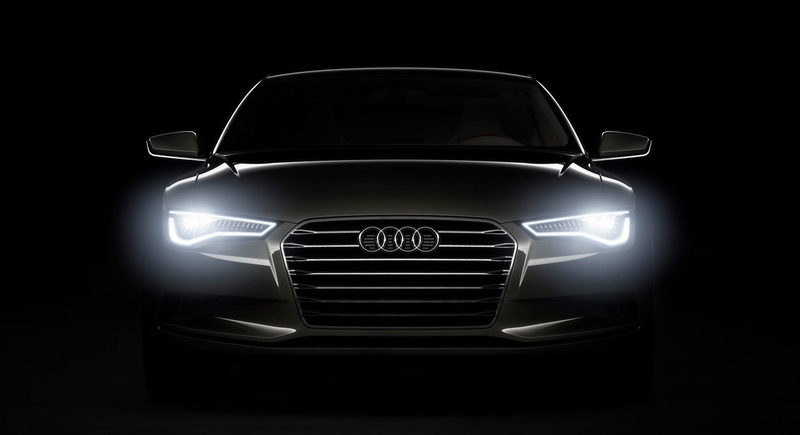 #7: If someone behind you flashes their high-beams, it’s because a) they want you to move over (to the right, except in Naples), b) they think you have attractive women in your car, or c) they are in an Audi. #8: Scooters, bicycles and motorcycles share the road with cars, but not the same rules. Motorcycles can dart in and out of traffic, pass on the right or left, and even drive on the other side of the road into oncoming traffic (check your insurance deductible). 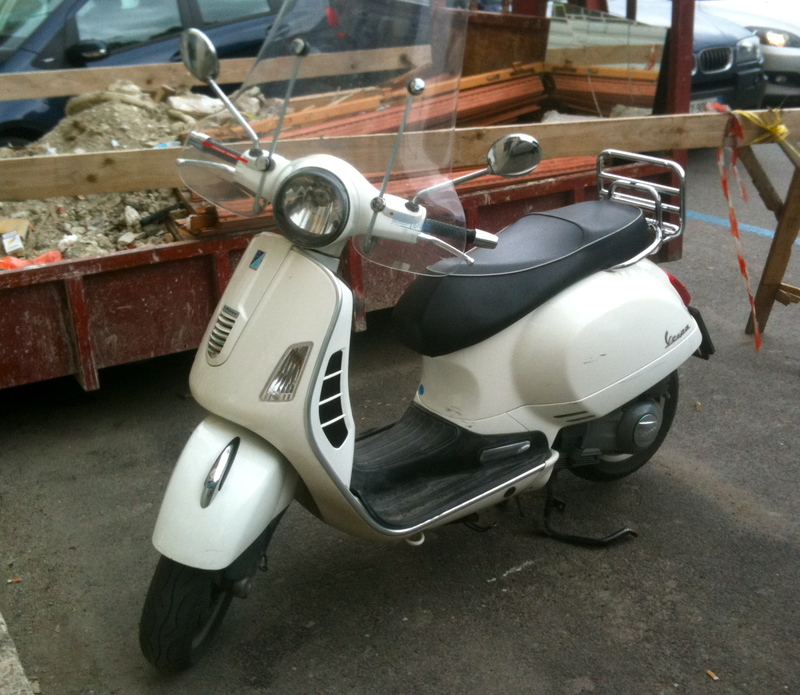 Scooters may ride anywhere, including sidewalks; they may park absolutely anywhere they please, including inside buildings. Bicycles…are just so freaking pathetic here, let’s not even get into a discussion of them. #9: Many gas stations, especially after hours and on weekends when the cashier’s kiosks are closed, take only cash at pre-paid machines. Oh, and the helpful Eritreans who will offer to pump your gas – they don’t work at the stations. They want to rob you. #10: No turn on RED. Except in…you guessed it! July 2012 – I ( american woman solo traveler)was assaulted and robbed while driving on the A 1 Autostrada just north of Bologna/Modena. Just 2 kilometers past stopping at a gas station, 2 young men in a small black Fiat pulled up alongside me and literally pushed me over to the right shoulder…I stopped, they pulled tight in front of me, and one man jump out of the car opened my passenger door and ran off with two bags on floor in front of passenger seat. I managed to make it to toll booth exit only 3 kilometrs further down the road, called police and spent 3 hours with police in town of Carpi in province of Emilio Romagna. Still traumatized, and lost passports, credit cards and cash. So sorry to hear this. One tactic I have seen used successfully is to get out your smart phone and take pictures of the creeps while you are still driving. Or to appear to be talking to someone on the phone (or actually talking to police, etc). Also honk your horn. Flash your lights. Sometimes this scares them off. Were all your car doors locked? Hi Jerry Garrett, Just wanted to remind you that I (american woman solo traveler) was assaulted and robbed while driving on the A-1 Autostrada just north of Bologna….see my post last August 2012….still traumatized, i hope you will remind travelers going to Italy this summer to please be careful !! MY car doors were locked, but i got out of car, and when i did that , the doors on the VW Passat suddenly, automatically UNLOCKED !! and the thief opened passenger door and stole two small bags on the floor in front of passenger seat. My drivers license and passports were stolen, the police in village of Carpi gave me a paper report which i was able to use as a drivers license. passport. LOL – having lived in Naples many, many years ago…your comments brought back many memories and made me laugh. Everything you said is true! Thank you! A new phrase I heard today, “If you brake, you lose.” That explains a lot! Excellent post and funny! But what you say about Naples is pretty much true 🙂 And it also applies to Palermo and Rome to some degree. You forgot to mention how expensive the gas is in Italy. For that very reason, it’s best to avoid the headaches and take the train or bus whenever you can! Very true about the train and bus being better values. The tolls that Italy charges on its autostradas these days are outrageous; the non-toll roads are all clogged with the worst kind of traffic. What utter (and racist) nonsense. It might have been more helpful to let people know that although those people (who might be from any number of poor and troubled countries) don’t work at those stations, they will feed the cash into the machine for you and put the fuel in your tank. Yes, they expect a tip, but they’re just trying to make a living in a difficult situation. Nobody sits all night at a fuel station unless they have to.